This is what he looked like for a while. Like he went to Ishtar and asked to borrow their look. George Manury was the first man on the scene, aside from the stage dudes, and myself. He pulled up on his bike and asked what he could help with. 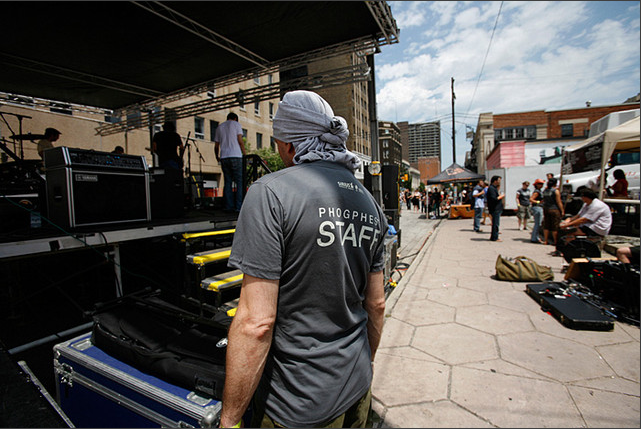 He knew he was the indoor stage manager after 2pm, but he wanted to lend a hand. Now, the initial investment George was SUPPOSED to make was from 2pm-5pm inside, and then every OTHER 30 minutes until 2am. George was running inside and out, helping on BOTH stages. Not only was he letting bands who were playing inside know that they needed to get GOING!!! But he was also running around to help prepare the outside stage! Believe me, the inside stage alone, with sound being done by Scott Barlow, is a big job. George didn’t have enough trying to erect the stage, the canopy roof, the tents around the area, the fencing, among other things. They went on to tell me that he was making up time with all the bands, because we were chasing a schedule from the word “go”. George was telling bands that they were already over time, and that they needed to get their set-time down, just to get the schedule back on track. The schedule was saved, twice. Once before the Radio 3 broadcast, and once after the broadcast. He never stopped, and he never worried. He was the cooing, calming voice telling me that everything was going to be fine. He stopped to smell the flowers. I remember seeing him standing still, watching music, inside and out, ENJOYING THE SHOW. This must come with experience, because Frank and I ran around like chickens with our heads cut off, trying desperately to keep it together. Mr. Manury is a phenomenal example of a community supporter, organizer, and champion volunteer/helper. He was titanic in his efforts, and it never for one second went unnoticed. For this George, we thank you. This entry was posted in Uncategorized and tagged cafe, canada, cbc radio 3, detroit, entertainment, events, George Manury, indie, live music, lounge, ontario, phog, phog phest, venue, windsor. Bookmark the permalink. totally, totally, george was AMAZING. i loved him. totally, totally. george was AMAZING, we LOVED him. I was surprised at how someone could be running around, doing SO many things at once but still smiling and having a good time.